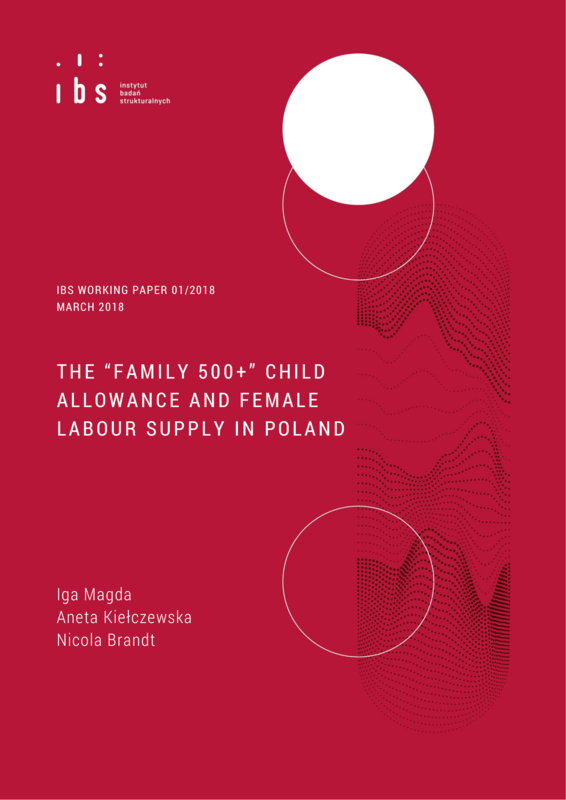 In 2016 the Polish government introduced a large new child benefit, called “Family 500+”, with the aim to increase fertility from a low level and reduce child poverty. The benefit is universal for the second and every further child and means-tested for the first child. Increasing out-of-work income significantly, the transfer reduces incentives to participate in the labour market through an income effect. We study the impact of the new benefit on female labour supply, using Polish Labour Force Survey data. Based on a difference-in-differences methodology we find that the labour market participation rates of women with children decreased after the introduction of the benefit compared to childless women. The estimates suggest that by mid-2017 the labour force participation rate of mothers dropped by 2.4 pp as a result of the 500+ benefit. The effect was higher among women with lower levels of education and living in small towns. additional information: The paper benefitted greatly from comments and suggestions from Peter Jarrett, Pierre Guérin, Piotr Lewandowski, Andrea Bassanini, Joanna Tyrowicz and seminar participants at the IBS and the OECD. This study is based on data from Polish Central Statistical Office (GUS), Labour Force Survey 2010-2017. GUS has no responsibility for the results and the conclusions, which are those of the authors. The usual disclaimers apply. All errors are ours. *The second version of paper has been published as an IZA Discussion Paper "The Effects of Large Universal Child Benefits on Female Labour Supply" (No. 11652).